Thursday is GURPS-Day, and as part of writing a future entry in my Violent Resolution series (it should show up as my fourth content post, I think), I got thinking about armor piercing weapons again when reading about how the Oakeshott Type XVII sword typically had hexagonal cross sections so they could punch through armor better on the thrust, etc. I’ve seen arguments (and one optional rule appears in print in Low-Tech, p 102) that edged weapons have a hard time penetrating any sort of metal armor. On the other hand, weapons like the pollaxe would mount two out of a hammerhead, spike, or axe blade (plus a nasty spike on top, likely for thrusting into joints?). Just musing here, and wondering if a way to go would be to apply some sort of conditions to the armor divisor, as we oscillate between (0.5), (1), and (2). Take two weapons that each weigh 2-3 lbs, but one has the weight distributed through the entire blade, with a nice hunk of steel at the pommel as a counterweight to the blade. Then take a weapon that has most of that mass concentrated at the end. Which hits harder? Almost always the tip-heavy weapons have a few more points of damage, but I’m not sure that’s enough. Let’s say that U is a “more bad” shift in the piercing department. Hard to imagine that a narrow edge is worse for armor piercing than a blunt crushing head, but I can certainly see where they would both be bad. But let’s take Low-Tech at its word, and say that cutting and crushing are one shift worse, but impaling is one shift better. I’m going to leave this one alone, largely because of the already-huge difference in damage between thrust and swung weapons. Likewise, 1H and 2H use of weapons is already controlled for in the statline. Sword: Balanced (0), cutting (-1). -1 shifts. That’s the (0.5) suggested. If we go crazy and use the size and speed range table, it would be (0.7). We’ll do that from now on, actually. That’s when it’s swung. If you thrust it, it’s impaling (+1), and thrust from a defensive grip, it’s (+2). Again, that’d be thrust for (1.5) and (2), respectively. Axe: U weapon (+1), cutting (-1). If you thrust with an axe in a Defensive Grip, you’d be looking at crushing (-1) but with the extra stability of the grip (+1) for a net of no change. So an axe is better than a sword, as it should be, and basically strikes even-up against armor. Axe is sw+2, so 2d+2 cut. Warhammer: The military pick, it’s swung (ouch) for impaling damage (+1) and is a U weapon (+1). That makes it a (2) armor divisor. Damage 2d+1 (2) imp. Pollaxe: swung with the pick end or an axe, you get the same as above. With a hammer, it’d work like a mace, with a +1 for the U stat but -1 for the crushing damage type. So it strikes with no armor divisor. The hammer is 2d+4 cr; the pick is 2d+3 (2); the spearpoint is 1d+2 (2) imp, and an axe-blade is 2d+4 cut. Spear: Balanced (no change), impaling (+1). So in one hand or in two hands but leveraging the reach of the thing, you get a (1.5) armor divisor using the SSR table. In a close-in defensive grip (-1 yard to Reach), you get a (2). With two hands you’d get 1d+3 (1.5), defensive grip would be 1d+2(2) I think. I’m not sure I’d use this myself, but I got into a rules tinkering mood as I was writing into the wee hours last night, and I wanted to explore if there was a systematic way to look at the different ways to punch through armor. Right now, a thrust is basically half the penetration as a swing. ST 14 is 1d thr and 2d sw, to pick the most obvious example. Thrusts are usually impaling on bladed weapons, which means they can target the vitals, and on a unarmored target, the impaling helps ease the loss of raw force – but not fully, since cut is x1.5 and imp is x2 . . . or again, x3 for vitals. 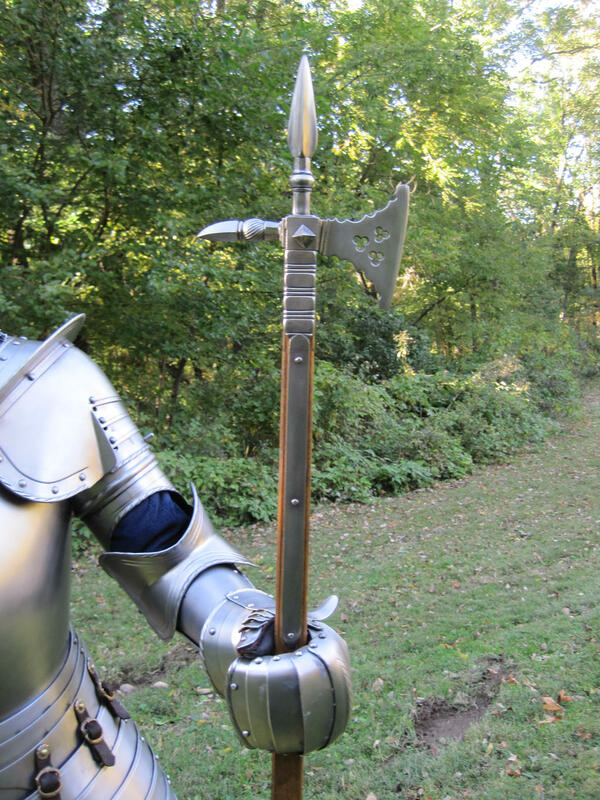 The addition of armor divisors to many thrusting weapons, and additional help from taking a defensive grip (half-swording) would make thrusting vs. armored opponents a more appealing choice than swinging. Against DR 6, a swung sword with ST 14 would actually be facing DR 9 due to the armor multiplier, and with 2d+1 for a broadsword, you’re going to need a good roll. With a half-sworded thrust, you’re facing DR 3 with 1d+1 imp, which is a real threat.With a regular thrust, it’s DR 4 and 1d+2 imp. Basically the same in this case. But with a more realistic rescaled value, for those that do that, those armor divisors are going to be key to getting emergent behavior out of the mechanics. This is interesting. A while back I'd experimented with U weapons reducing DR (rather than devising it), but I never made any use out of it. The reason a narrow edge is worse than a blunt head is, as you mentioned, the lack of mass; a narrow edge of a sword is not going to have enough mass to make armor easily yield. A blunt head slams with more energy. The wedge part of a sword's edge just doesn't really come into play much here. Sorry I couldn't find your email so I thought I would ask in the comments, my name is Andrew L Kolodziej and I run a blog called http://www.thedailyrpg.com and was wondering if you might be interested in exchanging links with me. Thanks.